Volkswagen diesel car scam is of no consequence to us. India’s diesel vehicle industry is so powerful that even this exposé of the cover-up of diesel emissions is like water off a duck’s back to them. They should be renamed Teflon Diesel. They will ride it out, literally, even if it means we choke and die from deadly emissions of their vehicles. My experience with the diesel vehicle industry teaches me this. It was in the mid-1990s, when the air in Delhi was black with smog, that we at the Centre for Science and Environment began work on controlling air pollution. Scientific information was trickling in that diesel emissions were much more toxic than understood. This is because diesel vehicle technology had an intrinsic problem. As fuel quality improved to reduce sulphur, it not only reduced the mass of particulate emissions, but also the size of the particulate matter. The world for the first time learnt about respirable suspended particulate matter. These tiny particles were deadly because people could inhale them. Particulates could even enter the bloodstream, leading to respiratory and cardiac ailments. A few years later, efforts to reduce these tiny particles led to the birth of another pollutant: nitrogen oxides (NOx). In 1998, when we put together the body of evidence against the “engines of the devil” the vehicle industry was furious. Tata Motors, which was just venturing into making private vehicles run on this dirty fuel, slapped us with a Rs 100 crore defamation suit. It argued there was no way to prove that particulates were toxic. The Supreme Court did not listen to it. It asked for all diesel-fuelled commercial vehicles in Delhi, from buses to three-wheelers, to move to compressed natural gas. It also directed that the quality of fuel had to be improved. But dirty diesel still won. In the decade of 2000 the vehicle industry, led by a handful of companies—Tata, Mahindra & Mahindra, Ashok Leyland and Eicher—struck a gold mine. They cranked up the manufacturing of private diesel vehicles using the ruse of so-called cleaner fuel, while taking advantage of the fact that diesel was kept cheaper than petrol in the name of the poor and public transport. By the mid-2000s over half the cars sold in India were fuelled by diesel. Every time we pointed out the overwhelming evidence of diesel’s toxicity, we were brushed aside. It was said that Europe, beacon of greenness, was fond of diesel. It could not be wrong. When we pointed out that Europe was incentivising diesel because of its better fuel economy and carbon dioxide emissions, but was struggling with local air pollution because of tiny particulates and NOx, we were dismissed. The industry was on a roll. Diesel vehicles were allowed by law to emit seven times more particulate matter and three times more NOx than petrol vehicles. Fuel was cheap. There was money to be made. Public health was damned. They also continued to sell dirty trucks and buses across India. Their argument was that clean fuel—that met Bharat Stage IV standards or the 50 ppm limit for sulphur—was not available across India. As a result, the vehicles that run across the length of the country and traverse mega cities like Delhi use dirty technology. If they move to Bharat Stage IV emission standards, they would become 80 per cent cleaner. But why clean up fuel, technology or air? The rich can jump ship and leave the country or install particulate filters in their homes. The rest, according to the diesel industry, do not matter. So, business run on dirty diesel has boomed. Nothing touches Teflon Diesel. Not even the current public health crisis in our cities. Today it is clear that dirty air is killing us slowly but surely. Cars, buses and trucks running on diesel are a big contributor to the pollution. We must urgently improve fuel and technology standards for vehicles but Teflon Diesel is in the way. The government’s roadmap for improving the fuel and vehicle technology is designed to ensure that Teflon Diesel has a good run for its money. The roadmap does not push for a quick move to nationwide Bharat Stage IV standard, allowing the industry to sell dirty commercial vehicles for at least another two years. It will also not ask for a transition to Bharat Stage VI by 2020, thus, delaying the cleanest fuel and technology. Why? Petrol vehicles can easily meet Bharat Stage VI standards by 2020 but not the diesel ones. Volkswagen’s subterfuge on emissions has exposed this. This is when India is far behind European vehicle emission standards, which, in turn, lag behind US standards. Europe took an incremental route to clean vehicle emissions and ended up incentivising diesel, something that is now costing it dear. 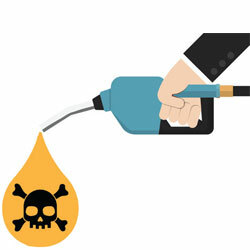 Its high NOx emissions and a growing threat of black carbon emissions are forcing it to rethink the diesel car option. For all these reasons the global automobile industry is seeing the end of diesel. But not in India. Our health is not even on the agenda. So, die-sel it is. Why clean diesel is a myth in India? Most of the new SUV launches in Auto expo 2016 are only diesel variants. This dissuades people who want petrol cars and are forced to buy diesel ones. It also shows that the industry is so sure that no body can touch them.